2013 Premier - Marti was awarded 2012 Top Ten Best of Breed, he then went on to be selected in the semi-final round out of 20. At Top Ten Finals Marti went #3 out of those 20 semi-finalists. Just so proud of all his accomplishments. Two of Marti's sons (Hunter & Paolo) went BOB and group 3 at Premier 2013 and another son (Skipper) went Group 1 Total Dog out of a huge terrier group. 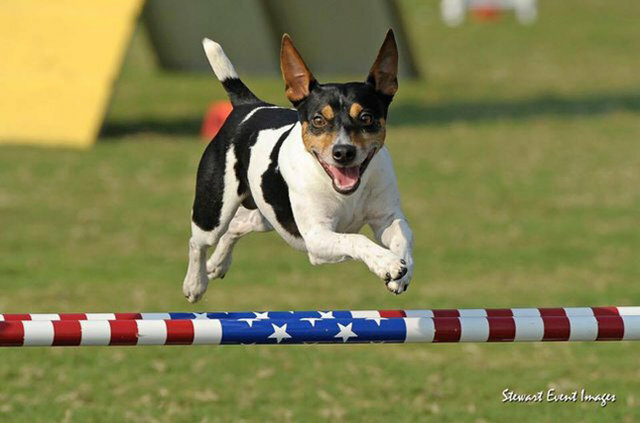 River Ridge Rat Terriers has won the American Rat Terrier Specialty in 2009, 2010, 2011, 2012 & 2013. We are so proud to have these incredible wins! Marti won in 2009 & 2010 and in 2011 & 2012 his son Sailor went on to take the honors. In 2013 Marti's son Paolo won the honor. River Ridge Tri N'Top This (Tj) was the 1st Rat Terrier to be awarded Best of Breed at the AKC Montgomery County Terrier Specality in Blue Bell, PA on 10.10.10! River Ridge Tri'N on Diamonds (Pixie) was awarded the 1st Best of Opposite! I am proud to announce that both Trevor and Hannah were selected by Dog Images for an incredible photo shoot. Dog images sells photos to companies who make all kinds of neat items! Now both dogs can be found on mouse pads, coasters, garden flags, large flags, floor mats and note cards. See the flags here: http://www.dogflags.com/. Click on the banner above and click shop by breed images to see the items. I am very honored that River Ridge dogs were chosen to represent the rat terrier on all these items. 5.10.08 Lydia RBIMBS Debbie Mitchell Handled by Kenny Gonzales. 2.16.08 Lydia BIMBS Ann Hearn. 12/8/07 Hannah BIS Judge Debbie Orwin. This year we moved into AKC and pulled some dogs from UKC, but thrilled with where we ended. UKC 2010 All Stars Marti & Sailor were ranked in the UKC All Stars Terrier Racing! Marti was awarded at 2010 Premier a Total dog, wining BOB and Terrier Racing Flat! 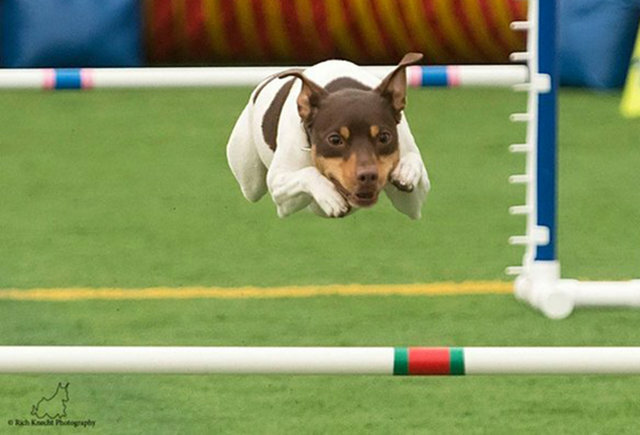 Marti was awarded American Rat Terrier Specialty Winner in 2010, the second year in a row to win the Summer Specialty! 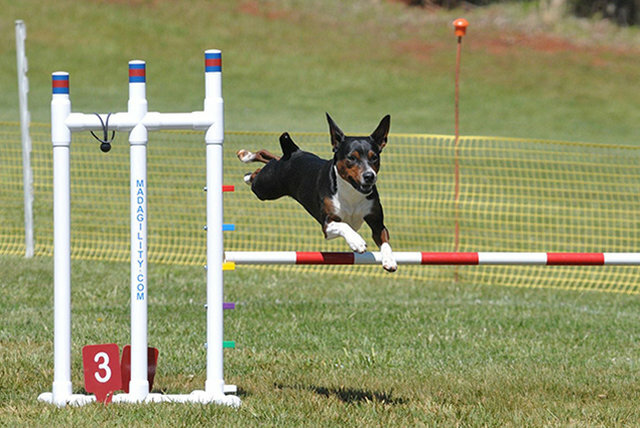 Marti was awarded at the North Carolina Classic two Total Dog, he is the first Rat Terrier to win a total dog in Terrier Racing! To date Marti has 16 Total Dogs 5 were won in 2010. GRCH'PR'StoneyBay's Ur martini's Serv'd Marti won 6 total dogs in 2009!!! We now have a FOURTH bred-by dog in the Top Ten! We are very proud to announce that GRCH River Ridge Shineon Sweet stuff(Hannah)ranked #7 in 2007 UKC's Top Ten. She started showing in May and continued hitting a few shows through December as she was still a puppy! Hannah is out of our Foundation male Trevor, who was just awarded 2006 UKC's Top Ten Best of Breed and Semi-final winner. What an amazing honor, accomplishment and a dream come true for our program. We also also proud to announce that Star's For your Eye's Only River Ridge (Bond)placed #5 in UKC's Top Ten for 2007. We are so proud and honored .. In 2007 at Premier TREVOR WON UKC's 2006 TOP TEN BEST OF BREED under Renee O'Donnell and continued on to be a TOP TEN SEMI-FINAL WINNER under Patrick O'Donnell. Trevor was 1 of 20 FINAL QUALIFIERS (Out of 487 outstanding top ten dogs) What an honor for Donna Sullivan/Four Paws (Trevor's Breeder) & River Ridge. Both kennels thank all the judges who reconginzed Trevor's excellence in 2006 & 2007.